From the "Urban Swales" project. 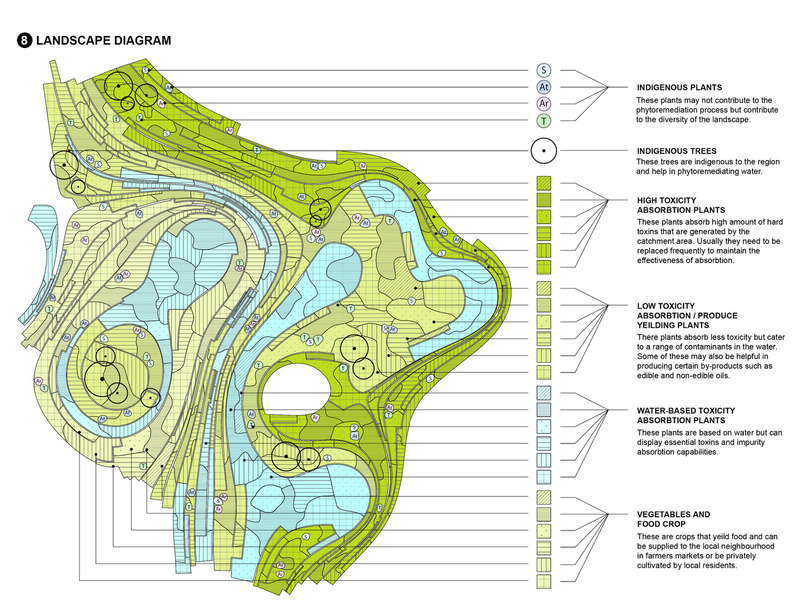 Credit: Geofutures @ Rensselaer School of Architecture / Muhammad Ahmad Khan (student); Chris Perry (program director), Ted Ngai, Fleet Hower, Kelly Winn, Lydia Xynogala (program faculty). Acknowledgements: Evan Douglis, Dean of the Rensselaer School of Architecture. 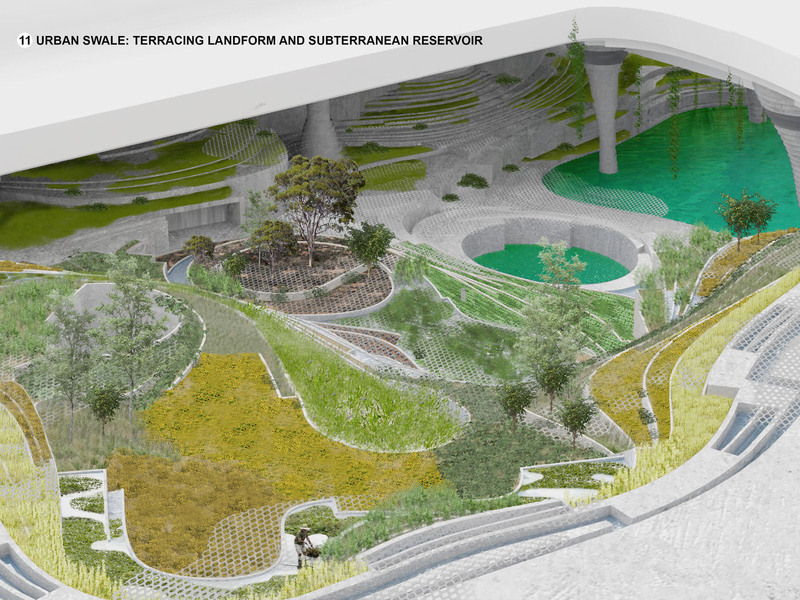 Urban Swales: Subterranean Reservoir Network for Los Angeles, by Geofutures @ Rensselaer School of Architecture / Muhammad Ahmad Khan (student); Chris Perry (program director), Ted Ngai, Fleet Hower, Kelly Winn, Lydia Xynogala (program faculty). Acknowledgements: Evan Douglis, Dean of the Rensselaer School of Architecture. Urban Swales proposes a series of medium-scale urban excavations throughout the City of Los Angeles, micro-reservoirs that, in addition to collecting periodic storm water runoff for remediation, storage, and redistribution to local communities, provides a new typology of shaded “urban caverns” for human as well as nonhuman forms of occupation. As such, Urban Swales not only functions as a distributed form of water management infrastructure, the general ambition of which is intended to relieve the city’s excessive dependence on imported water, but a new form of public space and wildlife refuge as well. Located at select intersections throughout the city, these “swales” tap into the street grid’s existing drainage infrastructure, effectively harnessing the urban fabric as an underutilized watershed for the collection and distribution of runoff. Storm water enters each swale at the street corners where it is temporarily stored before beginning its gradual descent down through a cascade of phytoremediation terraces. These terraces support plant life necessary for the various stages of water filtration, but also provide for human inhabitation through a “programmatic mat” of lightweight grating that serves as a walking surface. Additionally, the terraces encourage biodiversity among an extended ecology of insects, birds, and small animals, activating the swale as a refuge for wildlife. Urban Swales subverts the conventional quest for water as an act of drilling wells into the landscape. Rather than excavating and tapping into existing water reserves or aquifers, it instead activates the potential of dormant urban hydrologies. 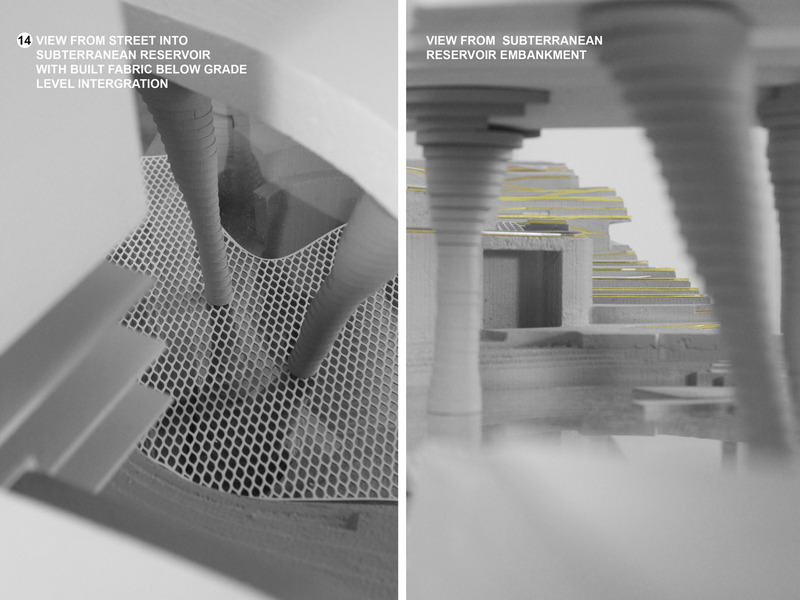 The new subterranean datum is carved into the urban fabric of LA; irrigated from within and diverting water out into the city networks. With time the “swales” not only become a fertile and lush ground but a new water source for the city. 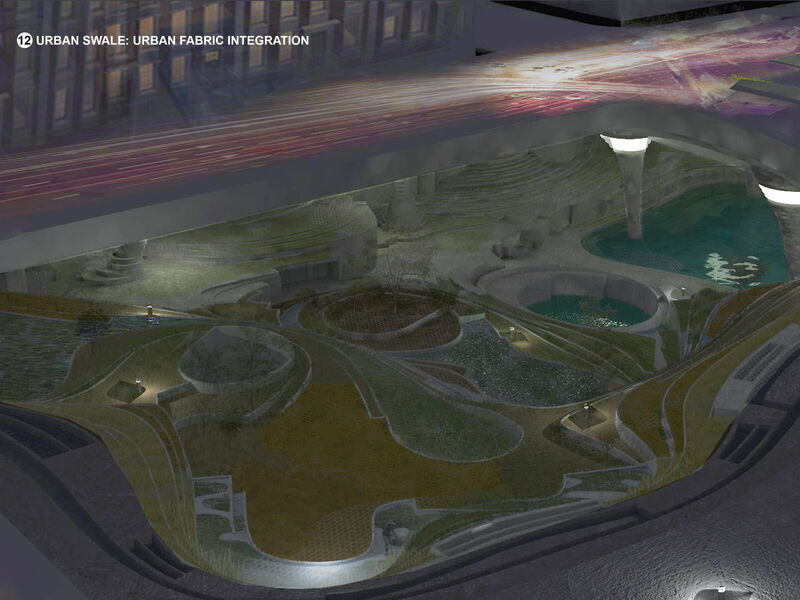 Check out the image gallery for Urban Swale's complete presentation.